Solve Thousands of Block-Sliding Puzzles Everywhere You Go! Includes hundreds of challenging puzzles. Simple gameplay mechanics make it easy to pick up and learn. Features multiple rule sets that can change the way you play. Can get pretty frustrating even from the very beginning. It’s time to put your thinking cap on. Unblock Me is a game of mental prowess that aims to test your puzzle-solving abilities, sense of space, and long-term planning skills like never before. Few other games out there can make something look so simple and yet have them be so fiendishly difficult, but that’s exactly what you will get in Unblock Me. Should you ever find yourself with a few free moments in your busy schedule, nothing will keep you occupied better than one of this game’s many brain-bending puzzles. The object of Unblock Me is easy. All you have to do is guide a single crimson-colored block out of a maze of regular blocks. In order to accomplish this, you must move the blocks around in a manner that will open the exit. Does that sound easy enough for you? It might seem that way at first, but watch out; you will be amazed at how tough these puzzles can get later on! Slide every block around with a simple stroke of your finger. Move blocks that have been laid out horizontally left and right. Move vertically-arranged blocks up and down. Solve over six thousand distinct puzzles. Reset the puzzle at anytime if you feel that you may have hit a wall. There’s more than one way to play Unblock Me. The game provides several ways to challenge you so that no matter what kind of gamer you are, there will always be something that is sure to twist your mind. Try your hand at four different levels of difficulty: Beginner, Intermediate, Advanced and Expert. Solve the puzzles via two different game modes: Relaxed and Challenge. 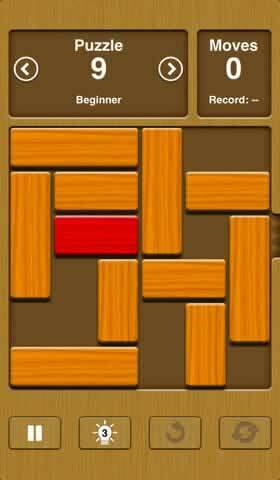 Play Relaxed mode to simply find the solution for every puzzle you come across. Play Challenge mode to see how efficiently you can solve the puzzles. Earn a three-star grade for your performance by using as few moves as possible. Replay puzzles you have already completed either for the sake of fun, to get some much needed practice in for the tougher ones ahead, or to improve your score. Alter the color of your blocks to get a look that suits you best. 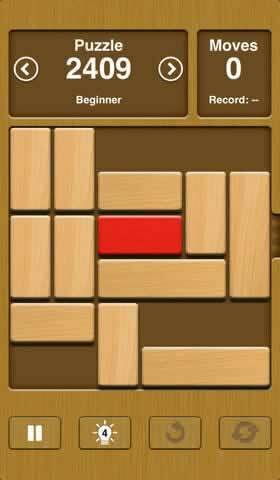 If you have a mobile device with touch-screen capabilities, like an iPad, iPhone, iPod Touch or an Android smartphone, then you can get started on playing Unblock Me right away. Better yet, you won’t have to spend cash whatsoever in order to enjoy all that the game has to offer; this version of Unblock Me is completely free and ready to play as soon as you download it! If money is tight and/or you’re constantly busy and on the move, then you cannot possibly go wrong with Unblock Me Free. It’s a challenging little puzzler that is easy to learn, demonically difficult to master, and which is guaranteed to make you keep coming back for more. There is always just one more puzzle to solve and with a little time, even the ones that have you stumped can be cracked. When it comes to mobile gaming, one thing that game designers need to take into account more anything else is time. You want to give gamers an opportunity to enjoy themselves in small quick bursts. In that regard, the puzzle game of Unblock Me can probably be considered one of the best out there. Unblock Me Free offers a puzzler that just about anyone can pick up, play and enjoy at a moment’s notice. It draws you in with its beautiful simplicity, and then turns itself on its head by becoming one of the most challenging things to ever fit into the palm of your hand. This may not always be for the best, but you’ll be loath to find a better deal for your mobile puzzle-solving needs. The most unfortunate thing about Unblock Me might be its presentation. Although few mobile games can be described as having amazing visuals, this one aims more for utility than anything else. If the aesthetic can be described in one word, then that word would be “wooden.” The game pieces in each level are displayed as a variety of literally wooden blocks on a literally wooden board that’s carried by a literally wooden interface. In short, this is not going to be the most interesting-looking thing your mobile device is ever going to show on its display screen. About the only color you’re likely to find is in the one block that you have to guide to the exit point of the board. You can change the color of the blocks to make things look prettier, but it’s still going to be the same boring-looking thing. On the plus side, they get the job done and it’s easy to see how everything is laid out with a simple glance. In truth, one can’t really fault Unblock Me for only offering what’s really necessary for its visuals. Thankfully, visuals are not intended to be the focus for Unblock Me. The puzzle-solving is where it’s at and it’s safe to say that it more than delivers on what it promises. The rules are simple; all you need to do is move the blocks around so that the exit point can be opened up to move the colored block out of the board. Blocks come in horizontal and vertical varieties, and both types can only be moved in horizontal and vertical ways respectively. That kind of rule can be both good and bad. On one hand, it keeps things challenging and is likely one of the ways the designers were able to put so many puzzles into this little package. On the other, it can come across as a tad too restrictive and means that there are only so many solutions available to you. Regardless, the control scheme itself is very easy to grasp and pretty fun too. Sliding blocks is as easy a process as simply stroking the screen with your finger or stylus. 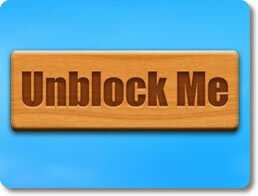 In that way, Unblock Me feels less like you’re playing a mobile game and more like it’s an actual physical object. This is neat and it helps the game seem more advanced than the otherwise bland visuals would normally indicate. Despite its simple rules, Unblock Me is anything but easy. The game is loaded with hundreds of puzzles. None of them take all that long to complete, but their solutions are seldom ever obvious. The first few puzzles you play are often easy enough, but it does not take long for the game to ramp up its difficulty. Puzzles get more and more complex, there are more blocks of different lengths arranged in more bizarre patterns, and more roundabout moves need to be made in order to get the special block out of the maze. In this regard, Unblock Me walks the thin line between being challenging and frustrating, and it sometimes falls into the latter category. It requires a great deal of spatial awareness in order to get anywhere; just moving blocks around willy-nilly is only going to get you even more stuck than you already are. As stated before, Unblock Me can be enjoyable when played in short amounts of time, but it can get very disheartening when those short amounts of time are spent struggling on one lousy little puzzle. Thankfully, there are several ways you can alter the game’s overall level of challenge. There are multiple levels of difficulty that ultimately determine what kind of puzzles you will tackle, ensuring that you get some much-needed practice on the lower difficulties before taking on the higher ones. However, even puzzles on the lower difficulties can get pretty hairy after a certain point. You can further tune your gameplay by playing on two different modes of play called Relaxed and Challenge mode. In Relaxed mode, you are free to solve the puzzles at your own pace, using trial-and-error strategies as you see fit. Meanwhile, Challenge mode requires you to solve each puzzle using as few moves as possible. This is pretty good for increasing Unblock Me’s already impressive replay value and can breathe new life into the old puzzles by adding a new level of challenge to them without resorting to cheap tricks. It’s also great for allowing you to get some more gameplay if you’re otherwise stuck just proceeding through the levels normally. The fact that the game includes a level selector makes it a snap to replay old levels in Challenge mode at any time. While the game can get frustrating in normal play, Unblock Me at least has the decency to offer an alternate way for players to challenge their minds and kill time. In the end, Unblock Me may not be the most exotic game you can get for your iOS or Android device, but it should definitely warrant your attention if you want a chance to exercise your brain a little. It’s simple on paper, yet challenging on multiple levels in practice. More than anything else, you can’t really argue with the price; Unblock Me Free can be downloaded and played at absolutely no extra cost! It may not contain as many puzzles as the paid version, but 800 puzzles is still nothing to shake a stick at! It can last you a long time if you let it.